#NYFW is in full effect. We're about a quarter in with major shows like the Jason Wu's, Tadashi's and my favorite to date Monique Lhuillier over and done. Although still in the hype of it all, their are some immediate trends throughout the collections I can't ignore. So here! 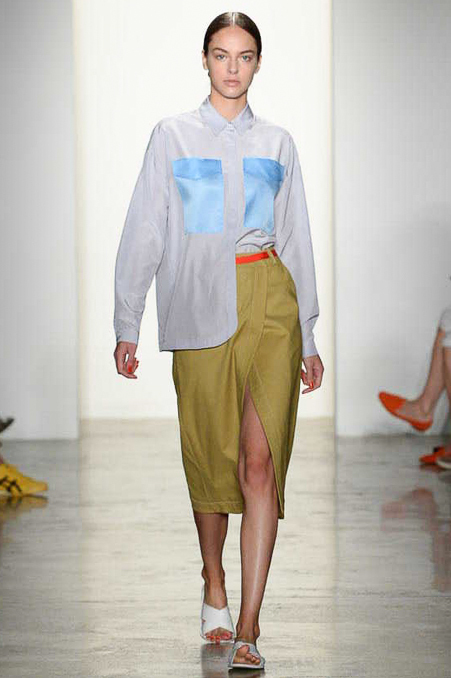 Pastels: Although a rollover trend from past seasons, the pastel palette is going strong. Designers have remained using the lighter versions of our favorite colors and have revamped them this season with washed out or saturated versions. Light colors are becoming seasonless as we see them complementing prints and textures of bolder sorts. They also make for beautiful monochromatic #ootd. Printed Pairs: Wasn't I just ranting about the power of the pair? Well, warped versions are appearing from design house to design house and crazing the runway. Pleasantly paired printed tops and bottoms of every make are making their way to surface. Kate Spade, known for her pungent print game, shined brightly when her models stood proudly and playfully in oversized florals and motifs. Jason Wu, on the other hand, made the pair a staple even for the most classic wardrobe by playing it up with plaid. Metallics: I must say, i'm thrilled to see the shiny character in everyone making a stand in stylish society. Metallics are becoming a fun form in how designers jazz up classic shapes. Choosing to make a jumpsuit in foiled violet is not just daring but confident enough to buy (you go Tia Cibani). Sporting such a statement will be sure to up your personal amp. School Girl Swag: There's lingering effect about uniformity. No further explanation needed. Will keep you posted for what the crystal ball tells me of day's 4-7. Until then, continue to dress up like it's for birthday. Tis the season. It's our holiday and you rule.